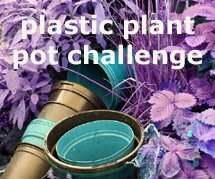 There’s no sign of a red and white striped shirt, bobble hat, or glasses in today’s challenge. 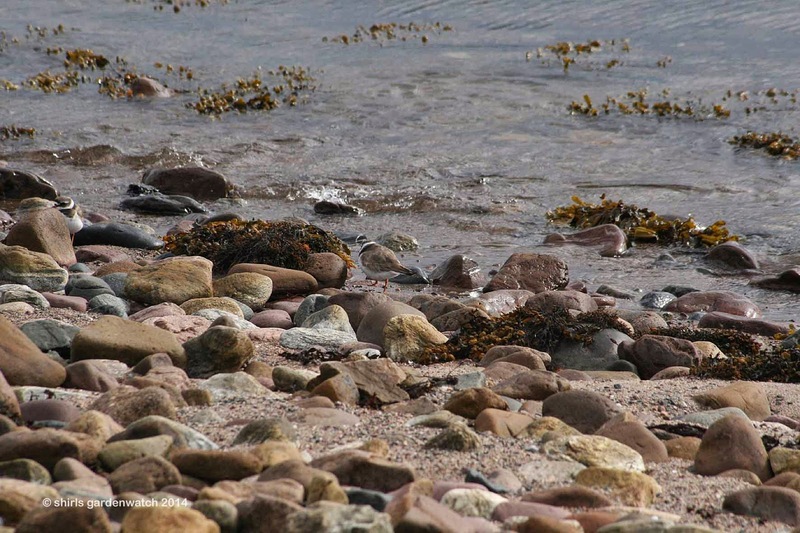 Wally (or Waldo in the US & Canada) has competition from a small wading bird very well hidden along the pebble shoreline of Loch Ewe at Aultbea. 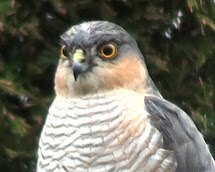 This is the bird mentioned in my last blog that had me smiling and stumbling in a hurry to capture photos! 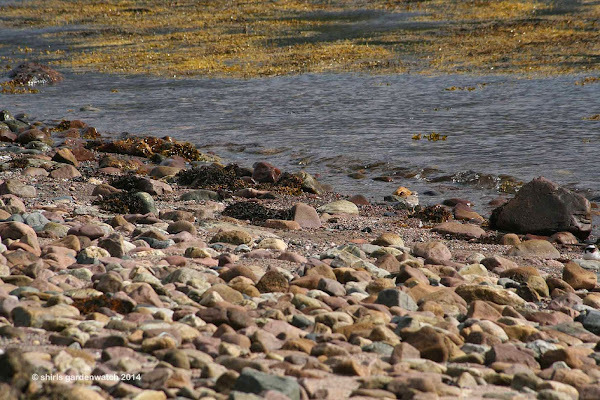 Wet pebbles and seaweed along this shoreline made for tricky walking at times. Too busy looking down at our feet we didn’t even notice the delightful small group of Ringed Plovers (possibly juveniles by their less distinct black collar) until we were upon them – and we got very close! 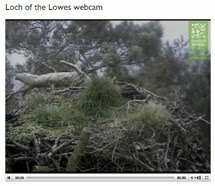 Having remembered the Little Ringed Plovers that captured everyone’s imagination when BBC Springwatch were at Pensthorpe National Park back in 2010 that was what I thought I was seeing! However, not being as familiar with wading birds as garden ones I didn’t realise there were two quite similar Plovers. 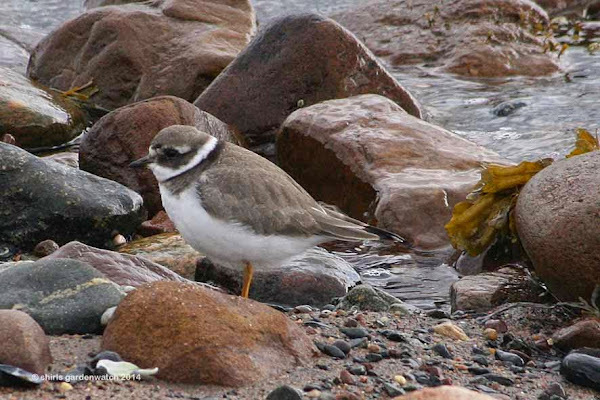 One of the main differences between the Little Ringed Plover and the more common Ringed Plover is in the eye detail - the Little Ringed Plover has a distinctive yellow eye ring. 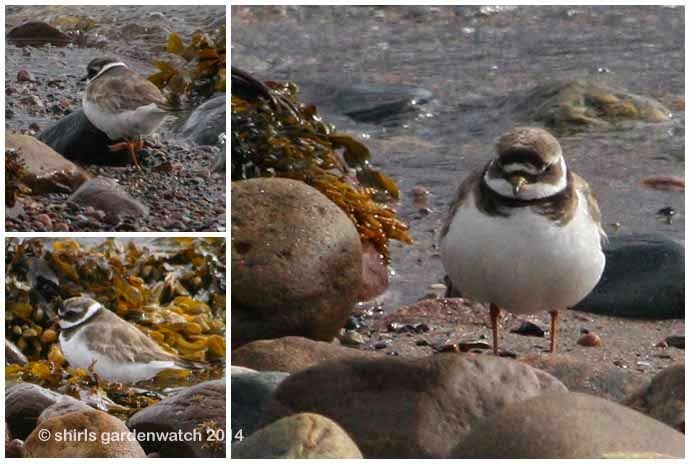 As the name suggests the Little Ringed Plover is smaller too but I couldn’t tell these differences when taking my photos. Ringed or not this was one of the highlights of this ‘gardenwatching’ year! (3) A good challenge now (answer at post end) - there are five Plovers to spot! 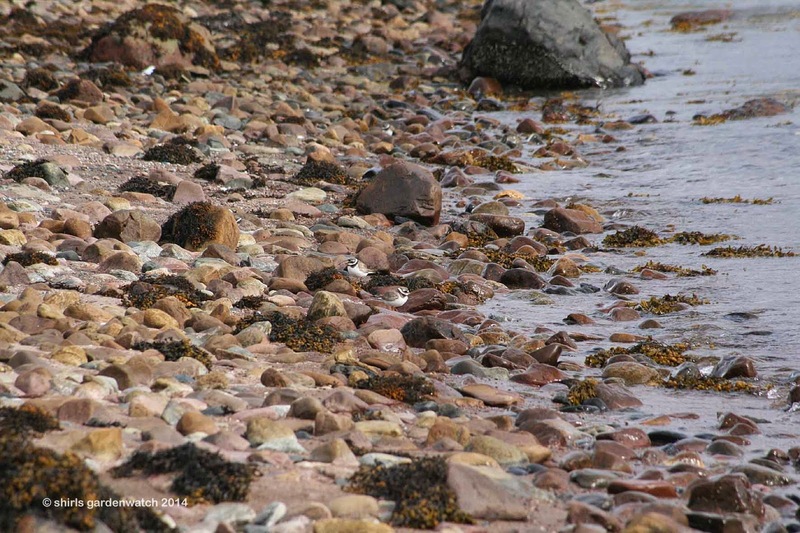 (5) This is what we are looking for - it’s brownish grey matches the pebbles. 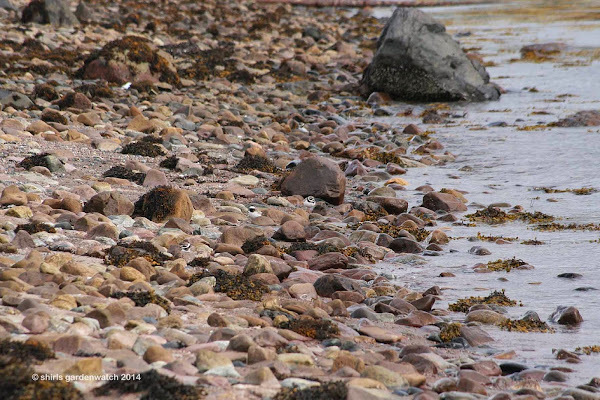 (7) Two Plovers this time – after the clues can you spot them more easily? (8) Two Plovers again – have your eyes become used to seeing them now? (9) So very well camouflaged as a pebble – only one Ringed Plover this time. 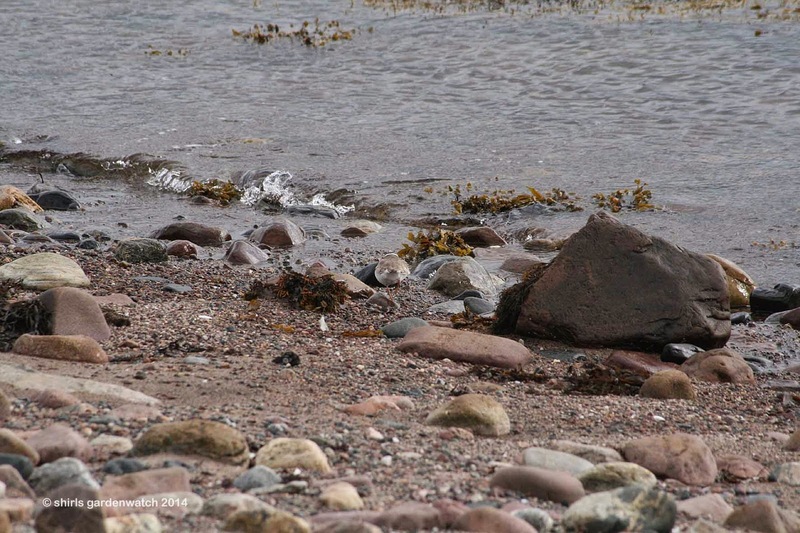 (11) Doubting myself now - could the sure two Plovers have a companion hiding? 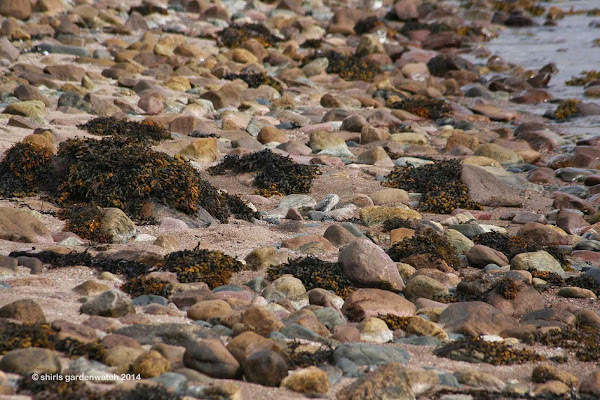 So our snow predicated last weekend and so far this week has been pretty much a no show (all slush) allowing me time to indulge in some fun with this post on my first ever Ringed Plover sighting back in August. 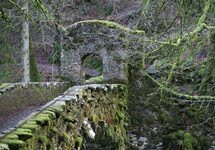 I hope you enjoyed the fun too - how did you get on? Perhaps today we will see heavier snowfall and the newest little garden visitor I thought I spotted here might return. The snow does bring more garden visitors to the feeders. However, the winds have been wild and we don't want blizzards on the roads for drivers. Wishing you all a safe weekend where ever you travel. 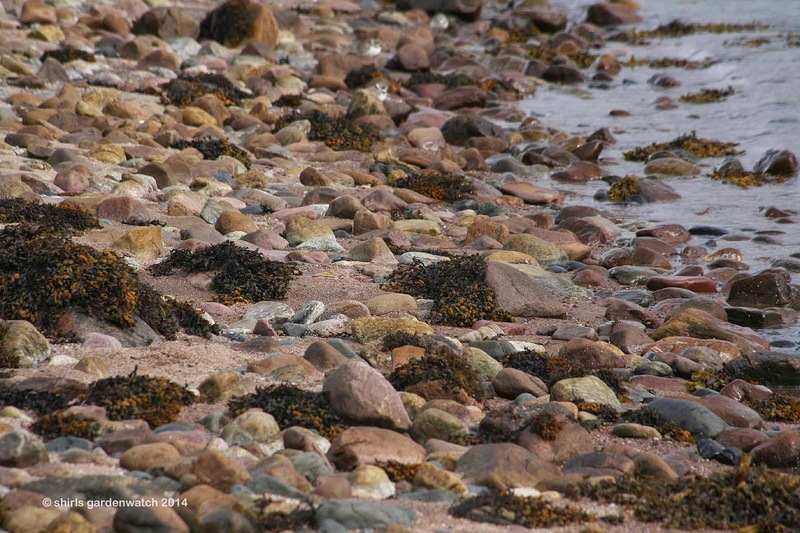 Answers: Locations of the five Ringed Plovers in images (3) and (4). 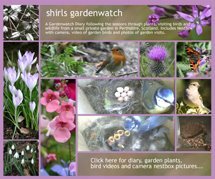 Copyright: Original post published on http://blog.shirlsgardenwatch.co.uk/ by blog author Shirley, December 11th 2014. They are almost impossible to spot until they move. Great little birds. I spent hours watching them this spring. 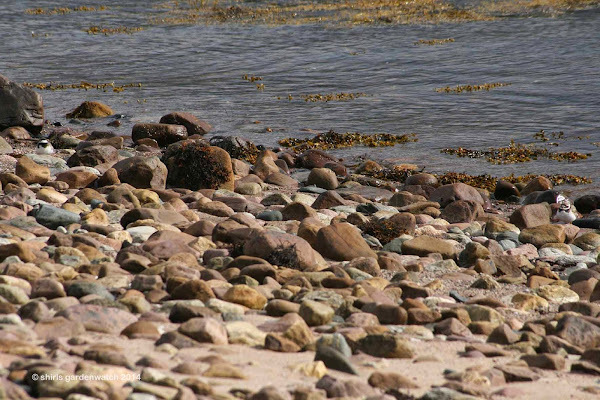 They have great camouflage on the pebbles. 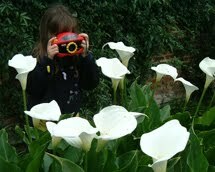 You did well to get the photos. Lovely series of photos of these little birds, on the first photo I really could not find them. Indeed when the eyes are used to the pebbles and birds it is easier and I also saw them on first picture. It was fun and I enjoyed it. They certainly are well camouflaged. I'm not good on waders either but U'm working in it. We had a huge flock of golden plovers at our local reserve. Easy to spot as they were on the water. Sneaky having the RIPL at the top of the first two photos. They are hard to spot. Cute little birds. Lucky you getting to see them. They disappear just by sitting down ... magic! Hope you have a good Christmas, Shirl, and best wishes for the new year. They are absolutely amazing. 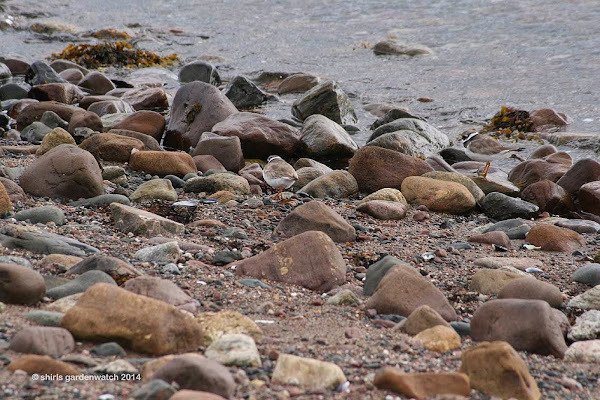 The "look for plover" game brightened my evening!! 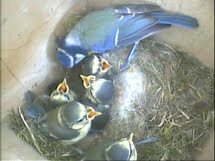 :) I joined the RSPB about two weeks ago and I am really looking forward to learning more about birds and other wildlife.